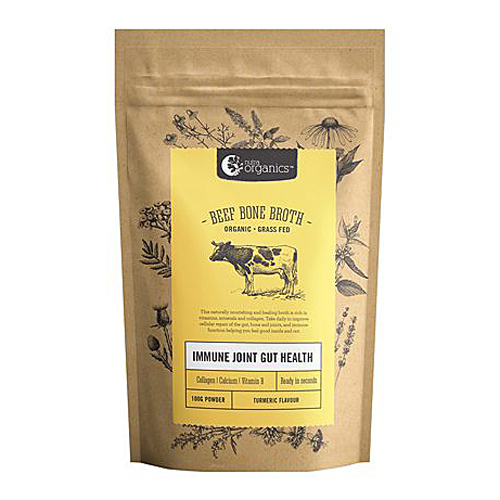 Bone broth has been made for hundreds of years by our grandparents and their grandparents. Bone broth is high in protein and rich in minerals that can support immunity and adrenals. It contains healing compounds such as collagen, glutamine, that can help with joint and digestive health, and reduce inflammation. Nutra Organics believe in providing the highest quality nutrition for our families and yours. They have lovingly brought you the best farm source produce for clean eating and wholesome nutrition in everything you create. Honest pantry staples for your wholefood lifestyle. The journey of wholefoods is simple, food in its most natural useable state, preserving the rich vitamins and nutrients, and free from antibiotics and hormones. Add more than just flavour, add health. Beef bones are added to filtered water and apple cider vinegar to assist in the extraction of the minerals and boiled down to form a broth. Himalayan salt is added for the final stage of the broth, for flavour and nutrition. The broth is then strained for impurities and as it cools the fat is skimmed off the top. The broth goes through a gentle refractant drying process taking care to preserve the rich nutritional profile. Nutritional flakes are added at the end for additional flavour and nutrients. Make nourishing broth in seconds, by simply adding to boiling water. 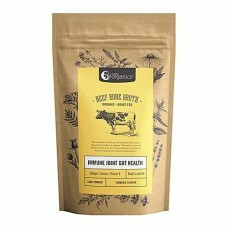 Use as a warming drink or as a base for soups, stews, sauces and gravies for nutrition and taste. You can substitute for liquid broth in any of your favourite soup recipes, or try out the recipe below. Grass Fed Beef Bone Broth Powder* (Beef Bones*, Filtered Water, Apple Cider Vinegar*, Himalayan Salt) Deactivated Nutritional Yeast Flakes, Turmeric Powder* (5% Curcumin), Black Pepper. Wipe mushrooms clean with a damp cloth; slice thin. Spread them onto a shallow oven proof baking dish in a double layer. Add the lemon juice, garlic, butter and oil, season with salt and pepper. Bake at 150C for about 1 hour or until they are completely cooked and the juice is thick and dark. Set aside a few mushrooms for garnish and put the rest in a blender or food processor. Add the stock and blend until smooth. In a heavy saucepan, heat the soup for about 5 minutes; add the cream and cook and stir for an additional 5 minutes. Do not allow it to boil! Pour into soup cups or bowls, garnish with reserved mushrooms and serve. Gelatin is renowned for its therapeutic properties, particularly gut healing and joint health. ..
XMAS Special - we like the pork gelatin for making Xmas treats like gummy stars or gummy bears, .. Bone broth has been made for hundreds of years by our grandparents and their grandparents. Bone brot.. This delicious beetroot chai infusion makes a beautiful vibrant pink latte. Naturally sweet with s..
All natural, easily digestible bone broth based protein powder in 3 flavours: Pure, Greens or Turmer..
All natural, easily digestible bone broth based protein powder in 3 flavours: Pure, Greens or Turm..
New Product: Bone broth has been made for hundreds of years by our grandparents and their grandparen..
With the goodness of turmeric and the unique healing properties of Manuka honey this delicious..
NEW FLAVOUR, with adaptogenic mushrooms. Bone broth has been made for hundreds of years by our grand.. Relaxing new sleep elixir!A nighttime nourishing sleep potion. A blissful blend of vibrant purple ..